I’m excited to be partnering with Walkers Shortbread today to tell you about their new gluten-free shortbread cookies and my rich and indulgent recipe for gluten-free Salted Caramel Shortbread Brownies, which I created using their cookies. Gluten-Free. Salted Caramel. Shortbread. Brownies. Yes, that’s what I said and they’re good as they sound. My mom ate one of these gluten-free Salted Caramel Shortbread Brownies and proclaimed them “excellent!” But let’s get to Walker’s Gluten-Free Shortbread Cookies, first, shall we? If you follow gfe, you know that I really don’t do that many product reviews, but some products I must have and try immediately—if they fit my requirements, of course. 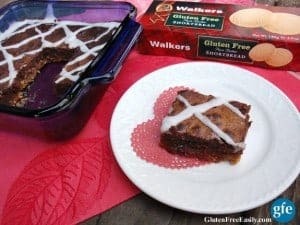 I absolutely adore shortbread and have really missed being able to pick up a package of delicious shortbread since going gluten free so I was excited when I was contacted about partnering with Walkers in checking out and using their Walkers Gluten-Free Shortbread. Then I asked if their products were certified gluten free. Their gluten-free line is certified gluten free by the UK Celiac Society, with every single batch of their cookies tested to ensure that they truly are gluten free to less than 20 ppm. I have to say that in my opinion they really do deliver, especially with their Pure Butter Gluten-Free Shortbread Cookies. The classic shortbread cookie has always been my favorite and Walkers new gluten-free version is a perfect substitute. When I am shopping and see this product, I will buy it. Every time. Their two other flavors of shortbread cookies are Ginger & Lemon and Chocolate Chip. I thought their Ginger & Lemon Shortbread Cookies were really lovely with their light lemon flavor and bits of ginger throughout, especially with a cup of tea. Their Chocolate Chip Shortbread Cookies made quite a tasty chocolate chip cookie, too. Again, I would eagerly purchase and enjoy these cookies any time. A nice little bonus is that Walkers new gluten-free shortbread cookies don’t cost much more than their gluten-full “ancestors.” There are nine cookies in each package and they tend to, uh, evaporate quickly. I received quite a few packages of these shortbread cookies to sample and use in my recipe development and one single package is left. I made the “mistake” of promising to let my Mom and my gluten-free aunt sample these cookies, so I dare not even open the box until I’m in their presence! I have not yet found these cookies locally, but you can order them online via Walkers Shortbread, Amazon, and other sources. Three of the most loved foods in the world---salted caramel, shortbread, and brownies---come together in these gluten-free Salted Caramel Shortbread Brownies. 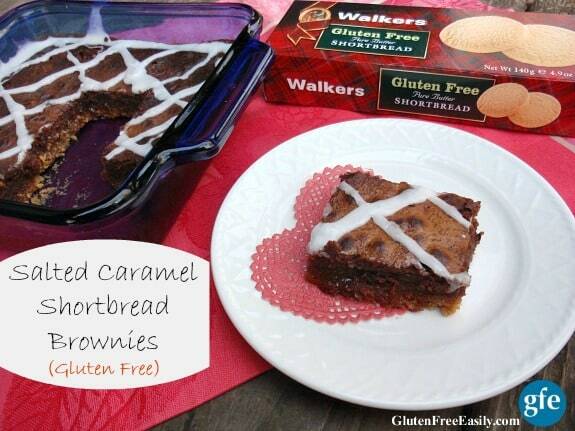 Walkers Gluten-Free Shortbread Cookies make a lovely buttery and crunchy crust. Preheat oven to 350 degrees F. Grease 8 x 8 baking dish. Mix crushed shortbread cookies and melted butter in a medium-sized mixing bowl. Once mixed, transfer the shortbread mixture to the baking dish spreading evenly with a spatula and, if needed, pressing it down with clean hands to form the crust/bottom layer. Using the double boiler method, melt butter and chocolate chips in medium-sized pan. Alternately, you can use a medium-sized bowl and melt your butter and chocolate chips in the microwave. If you do use the microwave, remember that chocolate chips will hold their shape until you stir them so don’t overcook your mixture. I placed the shortbread cookies in a Ziploc bag, sealed it letting the air out as I did, and then used a rolling pin on top of the bag to crush the cookies so that all the crumbs were fine and powdery. 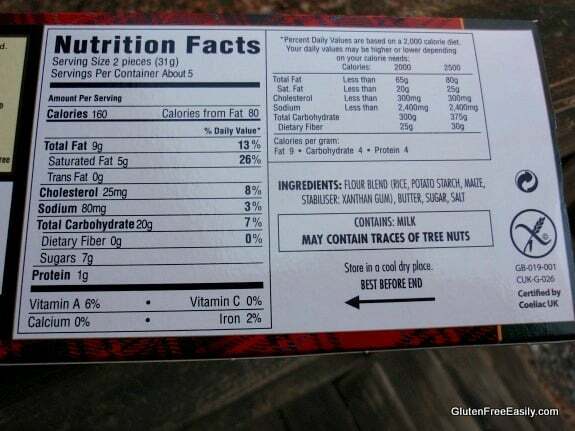 This only takes about a minute to go because the cookies are made from such finely ground ingredients and are so light. Some might prefer to use their food processor for this task and you can certainly do that, but if you do be careful that you don’t over process the ingredients and turn the cookies into a butter consistency.If you really like the salt factor in your Salted Caramel recipes, you might even sprinkle just a little sea salt evenly on top of your brownie batter before baking.If you don’t have a heavy saucepan to use to make your caramel sauce, you can use a cast iron skillet. I believe that you will have to stir your ingredients fairly constantly though because the liquid is spread out over a greater surface area and could burn more easily.Some of you will ask if you can substitute a ready-made caramel sauce. I don’t see why not as long as it’s caramel sauce---with the thickness that entails---versus caramel syrup that one might use on ice cream.I have little patience so I always “cheat” when it comes to cooling and thickening ingredients for recipes. I got impatient with the thickening of the caramel sauce at the very end of cooking it and just made a spot in my freezer for it. I placed it on a huge, thick potholder uncovered for about 3 to 5 minutes and it thickened very nicely. This post is sponsored by Walkers Shortbread, but the opinions expressed here are my own. Originally published December 3, 2015; updated June 22, 2018. I’m all about the traditional shortbread flavor! I’d love to try the Ginger & Lemon Shortbread! Lemon and ginger would be tasty to try. 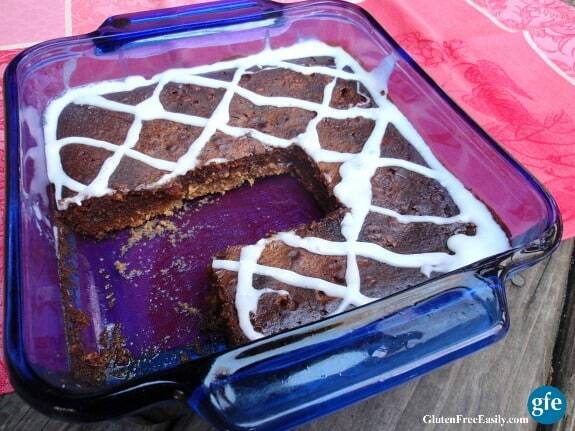 Oh my gosh Shirley, these brownies sound absolutely divine!! I wonder if I could sub the butter with coconut oil? Thanks, Kylie! Yes, I’m sure that you could use coconut oil. I always use slightly less liquefied coconut oil that butter. Personally, I’ve found that works better. The reason that I used butter in this recipe is because the shortbread cookies already have butter in them. If you’re making your own shortbread crust and it does not contain butter/is dairy free, then it definitely makes sense to go dairy free with the rest of the recipe as well. 🙂 Oh, and with the caramel, you could probably just leave out the butter and not sub anything if you wanted. 😉 Fingers crossed that those changes will work fine if you give this recipe a try! I would love to try the lemon and ginger flavor. I cannot WAIT to find these Walker Shortbreads locally- they were truly a favorite before my celiac diagnosis. I would imagine I will stay loyal to the original flavor (although that will never stop me from chowing down on the other two!) Thanks, Shirley! Twelve years ago I loved Walkers shortbread cookies…so happy they have come to be gf…. The flavors all sound yummy…. hope they find their way to my home….. Thanks again for your time & energy you invest on this site…. I LOVE Walker’s Shortbread, so knowing they have a GF shortbread is huge! This recipe sounds amazing. Good luck to the U.S. entrants — someone is in for a real treat! I have always loved the traditional flavor but would now like to try the lemon and ginger. I would love any of Walker’s shortbread cookies, they are my all time favorite. I have missed being able to eat them since having to go gluten free. My afternoon tea hasn’t been the same since I had to give up my Walkers shortbreads when I stopped eating wheat. Earl Grey. I would love to try these. OMG!! I want to find these in a store! Walkers cookies were a treat I would allow myself every so often. I’m sure they are all good but the all butter shortbread traditional cookie is the one I really can’t wait to try. Thanks SO much for the giveaway, Shirley. OMG, I am drooling . Would love to win these. Where are they selling? The traditional shortbread flavor is my favorite. Traditional Shortbread is my fave!! Oh my gosh… so excited to see Walker’s bringing out a GF line! Love, love, them – especially Traditional. Ginger & Lemon would be divine! The chocolate chip. But honestly, they all sound great! The girls & I would always go for the chocolate chip, but I know my husband would love the original best. So excited to know about these cookies as they would make a fantastic treat to send to my daughter at college. the ginger and lemon sounds sooooo delish! Traditional shortbread for me. I can’t imagine how amazing those brownies must taste. The lemon ginger ones sound tastiest to me! I would love to try the Ginger and Lemon Shortbread! I would like to try the ginger and lemon flavor. I love traditional shortbread but would try the lemon. Thanks so much! 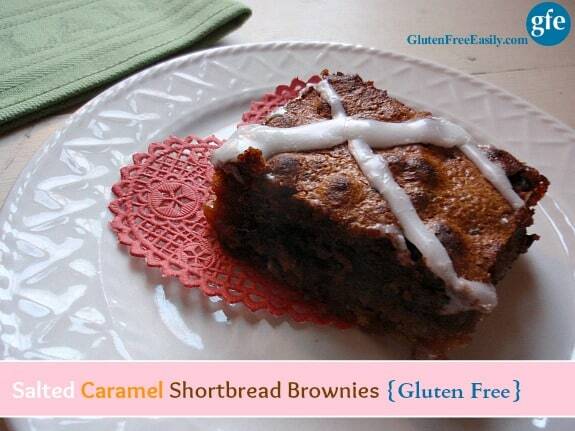 I want to try the Gluten Free Chocolate Chip Shortbread. 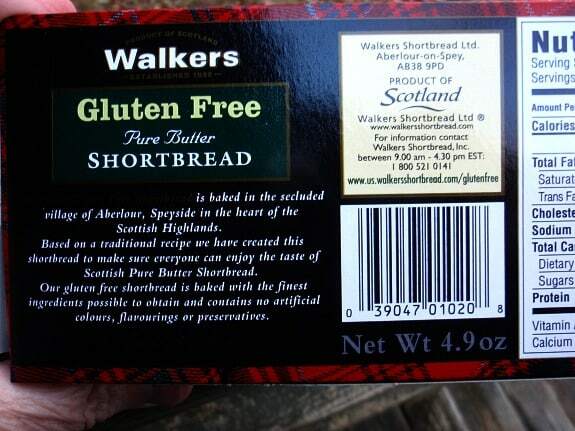 Oh my Shirley, I had no idea Walker Shortbread has gluten free. How exciting! They have always been my favorite! I think all three of them would be delish, but original butter is my fav! This is such great news for people with Celiac’s and who are allergy to wheat. This bars look incredible! Looks like it would be very tasty! Oh my heck, Shirley! You really outdid yourself here. These sound AH-MAZING! The Ginger & Lemon Shortbread Cookies sound really interesting! I’d love to try those. 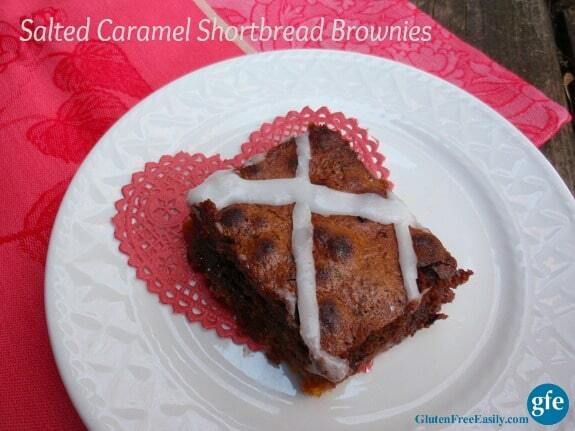 These are some of the best looking brownies I’ve ever seen! Thanks for sharing! I missed eating Walker’s Shortbread cookies every since I had to go gluten-free. I’ll so enjoy eating a loved comfort food again. Ginger and Lemon sounds interesting! I would love the lemon, but actually would love to taste any of the GF flavors!!! Thanks for the chance!!! This recipe looks yummy Shirley. Would love to try Walker’s Shortbread – see it all the time in the store, but never bought it. Hurray! I’m excited to have won – thanks so much! OMG Shirley! This is such an amazing recipe!!! I noticed the Walkers Shortbread over here just before Christmas, it looks fantastic! Sorry I’ve been a while popping over, I noticed you had posted the recipe but things have been a little hectic! I’ll catch up with you soon. Wow, those all look delicious. Amazon is out of stock so when they restock them, I can order some, and make those wonderful bars. I like it that you are using coconut milk, and I can easily substitute Earth Balance for the butter. How did I miss this recipe when it came out last year?! Whatever the reason, I am glad I found it now, and glad that you are resenting some of your greatest hits. I think I am slightly biased because I find all your recipes great, and so does my family.